I don't have a specific favorite color - I love LOTS of colors - most shades of blue, blue-greens are a fave, pink, a recent love of all vintagey whites, etc., etc. But one color that NEVER fails to catch my eye is RED. And the reason this color is on my mind is Valentine's Day, which is coming up. I can't stop looking at pinks, whites, and reds. 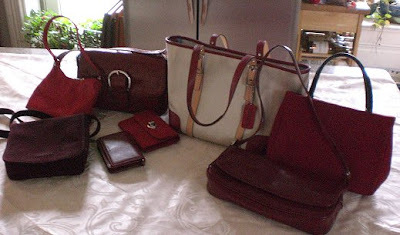 An assortment of my favorite purses. I likely have more, but these are within reach. Aren't they adorable together? Sorry for the bad lighting - overcast, rainy day. 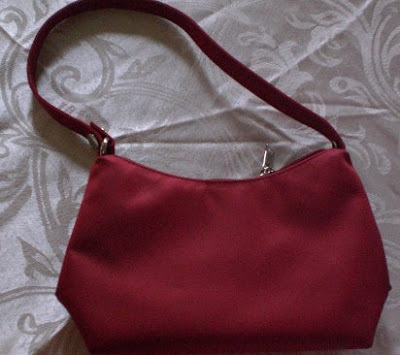 This is the first red purse I remember purchasing. It's like a cheap version of a little satiny cocktail purse, too small to hold much beyond some lipstick and a compact, etc. I don't think I've ever used it, but it's too cute and small to part with. It doesn't take up much room is my excuse. I probably bought this wallet at the gap at the same time - far more used - It's probably my favorite wallet as it has the easiest to open and organize features. Probably the last time Gap really made a worthy wallet, IMHO. Also last time they had really classic clothes they were known for - this is back in the '90's - then they turned trendy and it is soooo hard to find decently made classic clothes there. What happened to you, Gap? I still shop there and find the rare decent top, their jeans are still great, but last time I shopped there I ordered online, not being able to drive there and leave the house so soon after my operation and the clothes that looked the same as I'd bought last time came tissue paper thin. If I'd felt it in the store I'd NEVER have bought it. They cheaped out on the fabric of all the shirts and that really pissed me off - thus the rant, sorry. I had to drag myself to the store and return them as soon as I was able. Darn it. So few quality stores left and usually at prices I can't afford. /rant. Just look at the wallet and pretend I never went crazy about the store. 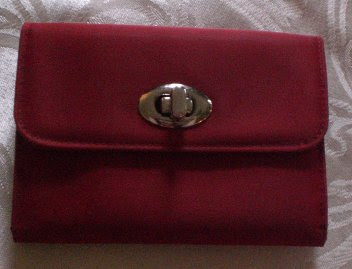 Ahem, now that my Gap rant is through - this is a patent leather, very thin red purse. 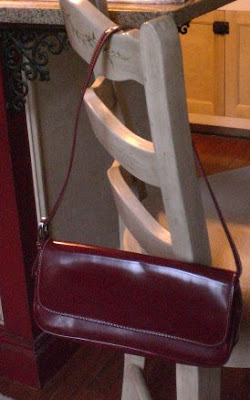 Doesn't everyone need a patent leather red purse? Well I do. Even if it also doesn't hold enough to be very useful. LOL Nice and shiny and oh so cute on the shoulder, though. 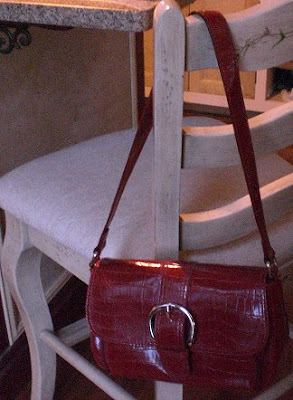 And also everyone needs a red crocodile purse. I got it from Target a few years ago as a present from my mom for starting an internship in March at the Missouri Botanical Gardens. I always think of how excited I was for the chance to work there when I see this purse. 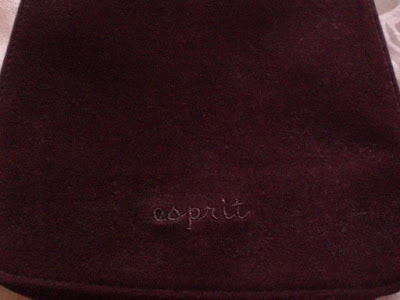 And a velvet Esprit purse I've had for many years - this close up is to show you how dark red, burgundy, really, it is and how velvety soft. 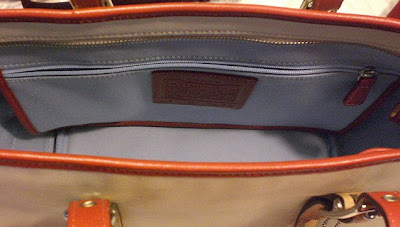 It has this super long strap which was really useful as a student to sling over like a messenger bag. I did use this in the winter quite a few times. Too pretty to part with even if I don't use it anymore. 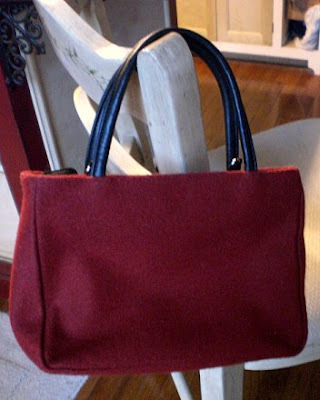 And while on the subject of winter red purses - you must own a wool one, too, right? Well, I do. It's so cozy looking. 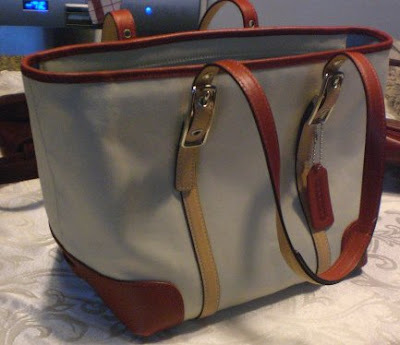 But this one - this is my favorite of all and it usually sits on a shelf protected all on its own (but filled with smaller bags so it doesn't lose it's shape and is still useful) - this is my Coach tote. I LOVE this purse. It's big enough to hold everything you need and even a book or a magazine and more. It's my special purse that I only use when I want to feel good about myself. I use it sparingly, though, as I don't want it to get an accidental pen mark or something on the precious canvas sides. 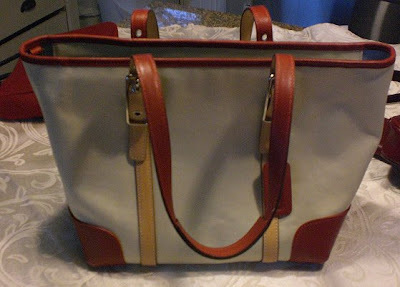 The red leather trim is gorgeous, though. 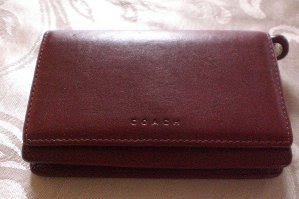 And as much as I love Coach purses - a special treat for me. I will admit that they sometimes have a bizarre humor and use a really UGLY lining in their pretty purses. Almost as a joke you'll find a pretty dark brown purse and open it up and there is neon green or orange lining inside that totally doesn't go and is actually an assault to the eyes. Now maybe they are trying to make it easy to see your stuff inside a dark bag, but there are FAR better colors and materials to use. Many a purse has been passed by for me because the lining is atrocious. But see here in this pic - the lining is sky blue!! Another big plus!! That's how you line a pretty and rather expensive purse, right? I love the inside as much as the outside. Next post: likely the unbelievable cute shoes I got from Santa - well, my mother. The light's all gone now and I want to show how just how precious they are. And maybe a few other items I got for Christmas because isn't it fun to show off your pretty new gifts? Every year at Christmas we make a great cheeseball/spread, which the look of I got from one of those little Holiday recipe booklets they sell at the grocery store years ago. 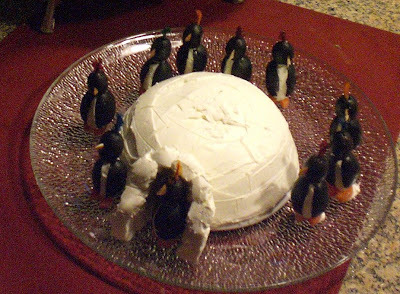 While the look of the igloo is the same, I detest blue cheese and also experiment and don't follow any recipe at all really when I make it so every year is a bit different, but always yummy - and a little spicy. Anyway - the igloo features little black olive penquins that are just too cute to eat, though they finally get eaten, too after awhile. 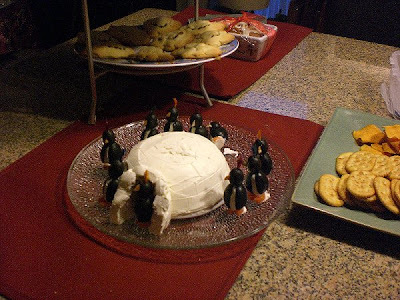 The penguins are made with jumbo black olives, split, stuffed with cream cheese, small olives for the heads and carrot feet and noses (though this year mom went with almond beaks for some reason) and then you stick a long flourished toothpick through the whole penguin and ta da! Something that has nothing to do with Christmas, really, but cute nonetheless and a treat I look forward to making each year. It's late to post a Christmas pic of a treat we had, but I kept forgetting to do it earlier and just now got around to it. I'm really procrastinating this year. If anyone is interested in better pics and a recipe for the cheeseball just let me know. It really is a great centerpiece. People are afraid to ruin the artwork at first and then soon enough they dive in and carve the heck out of it. Poor penguins being swallowed whole by some. LOL Might be fun to try, especially if you have kids that liked the penguin craze of the past few years. Remember how much I wanted that snow? I got it, less than predicted, but really cold temperatures to keep it around. It'll be 4 degrees tonight. So what happens? The furnace breaks. Yep. We're all freezing and bundled in blankets with the oven on and guess what? Can't fix it ourselves. Oh man, I was just asking for it, hm? lol Wish for my family and I not to freeze overnight. I take back the wanting snow comment - I wish it was summer now. ETA: Thank goodness for emergency repairman. Costs more, but worth it when you face freezing, literally. Aaaahhh...warmth. Don't let it happen to you! My only concern, made a sale on etsy and now I'll have to wait til I can get to the post office to mail it. Shouldn't be too long, though. It's 8 degrees outside and so dark cold a pillow stuck to a window with the freeze. And that's after we insulated it a few years ago because it's a broken stain glass window in my room. I can only imagine how cold my room would be if there wasn't an extra pain of glass there. 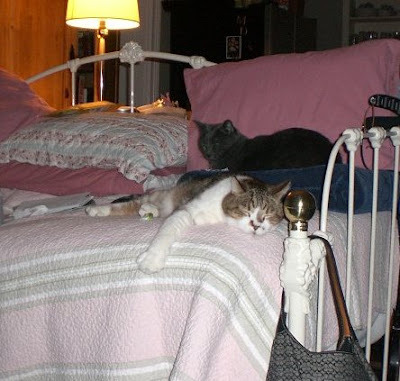 My mother's knocked out with a cold so I'm staying near her to take care of her and my kitties are snuggling up in warm beds throughout the house not caring I'm late feeding them even if I am up. This pic is a little old, but shows just how I feel, the need to snuggle in bed and just stay WARM. And yet, I wish it would snow, everytime it's cold enough to keep it here awhile it doesn't snow and then when it warms to barely cold enough then we get a light snow or cold rain. Darn it. I love snow it makes the world seem clean and calm. Hope everyone is looking forward to a brand new start and a new year with hope in your hearts. I am personally looking forward to a year with less pain, enjoying a straight back, a hope of being able to take a trip sometime this year as I haven't been able to in so long. Finally, having a studio in which to work in and not an overloaded little table stuffed with junk in the living room in which to work on and to truly be able to create some of the things I've been longing to for so long. And of course I wish for greater success in my shop, but even when I sell just one thing once in awhile I get so excited. :) Thank you to everyone's comments on it and their patronage - I am truly happy when I get feedback that someone loved their item or they gave it as a gift and it was well received. I can only hope to do better. But my greatest wish for this New Year is that our economy and state of the world in general improves. I have no naive ideals in world peace happening anytime soon, but a little bit of peace in certain parts of the world would be greatly appreciated by us all. I also wish for good health and happiness to my friends and family. I wish this for everyone that reads this and a toast to all you wonderful readers and especially those of you who comment - thank you for your support it keeps me going. And I also wish good luck to other shop and blog owners and those thinking of starting new ones in this new year. I know of a few who expressed wishes to do so soon and I hope they get the courage to do so this year. Happy New Year, Everyone - here's to 2010!! !